Did you put the expended on or is that from the factory? The original Loc-on stands had thin plywood platforms and it is scarier than all get out when your foot goes through after a few years of use. all i did was paint it with green and black spray paint and put a seat on it. everything else is factory. I dont know exactly how old it is but its pretty old. i didnt know they made them out of plywood. I didnt do much to it but for the price its hard to beat. Looks like a public land special!,only $10, that want hurt your feelings if someone else swipes it. I will hang some cheap stand up as well and if someone else decides they want it more than me it doesnt hurt my wallet. To bad your friend didn't have 4 or 5 more. yeah id be all overem if he did. Im gonna put some backpack straps on it, also am about to start lineman school so im gettin a new pair of spikes so ima be travelin ultra light. 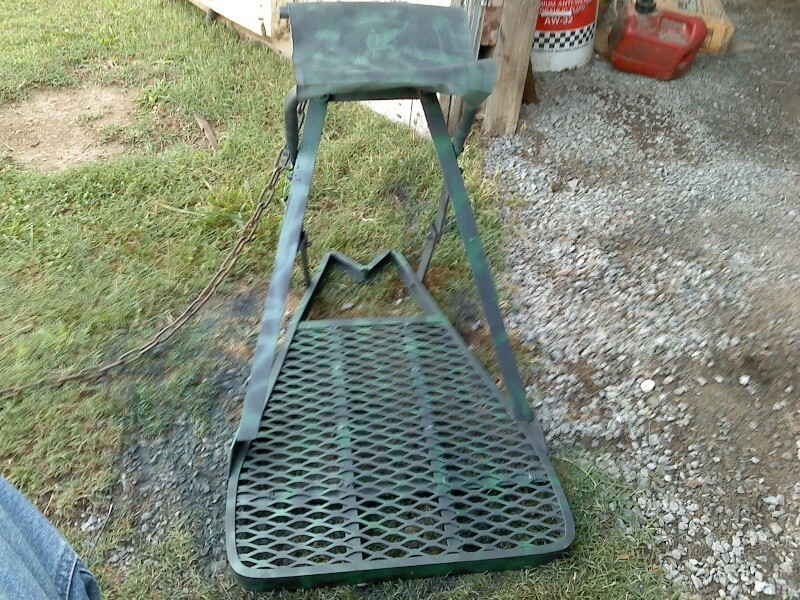 wouldnt bother me to bad but i could never buy this stand again in a million years for that price so im probly not gonna leave it, its gonna be my in and out stand. I suggest changing out the chain for a strap if this is going to be your moblie setup. Straps are queiter & easier to work with. Gorilla makes a nice strap. I already did, also i didnt trust those little hooks either so i put some chain link couplers in their place works well. Ima try tha gorilla strap, thanks cbigbear. No problem bro. You got yourself a good little stand & at a heck of a price. I've been trying to find one of the original Loc-on Limit or Windwalker stands. These were sub 6lb stands. No luck yet but maybe I'll come across one someday. Im not sure what it weighs but it doesnt weigh much, i knew id never run across a deal like that again so i boughtem without thought, and it has really turned out to be an excellent stand so far. Ive hung it in the yard a few times, seems to work well but we will know for sure when i start hunting with it. Also try flea markets,yard sales,and trade days, I like old school hunting stuff and places like these are the way to go. Good luck.